John with Mega bunny this past Saturday. When the rabbit is super happy, his little ears lay flat as can be! 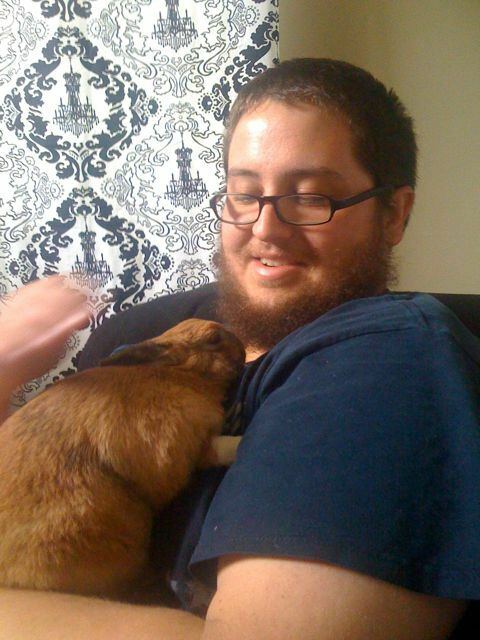 Megatron the rabbit on the very first day I got him! For anyone that follows John and I on Twitter or Facebook, you are pretty accustomed to seeing us post pictures of our crazy rabbit. Well, I think it’s high time you officially meet Megatron the rabbit. Yes, his name is Megatron. Yes, we call him Mega, Mega Bunny, Baby Bunny, or just Rabbit for short. I adopted him before John and I ever started dating. And, while it took John a good little bit at first to welcome this little furry creature in, he has since loved the bunny just as much as me! I mean, it doesn’t take long until this little guy makes you think rabbits are cool. I first adopted Mega in March of 2008, when he was 3 months old. I had just moved into my own apartment all by myself that January and really wanted some company. I always thought it would be fun to have a rabbit, so off I went to find a rabbit. No lie, totally fell in love with Mega. Don’t tell him, but in person, he’s like the fattest rabbit I’ve ever seen and that just sounded so cuddly to me! So, I got everything I needed to take care of the little guy and went to the pet store before they opened on the first day I was allowed to get him (around Easter time they wouldn’t sell the rabbits for a while because of too many people having buyer’s regret). So, there I was, like a freak, waiting in the parking lot to be the first one in the store in case some small child in pigtails wanted the same rabbit. I was prepared to push any small children over, because that was my rabbit. Creeper? Yeah, I know. Whatever. Since then, as silly as it sounds, little Megatron has been quite the buddy to me. My life was quite the interesting tailspin when I first moved into that apartment and he was my little buddy that kept me company when everything was so crazy. The day we lost our first baby, I came home from surgery, took a nap and when I woke up, John was still sleeping. So, I went over, and just kept petting little Mega. He just laid down and was so sweet, it was like he knew I needed a little buddy again. Now, having just moved and still adjusting to being outside of my hometown and trying to meet new people, my little bunny has kept me so much company during the day when John is at work. 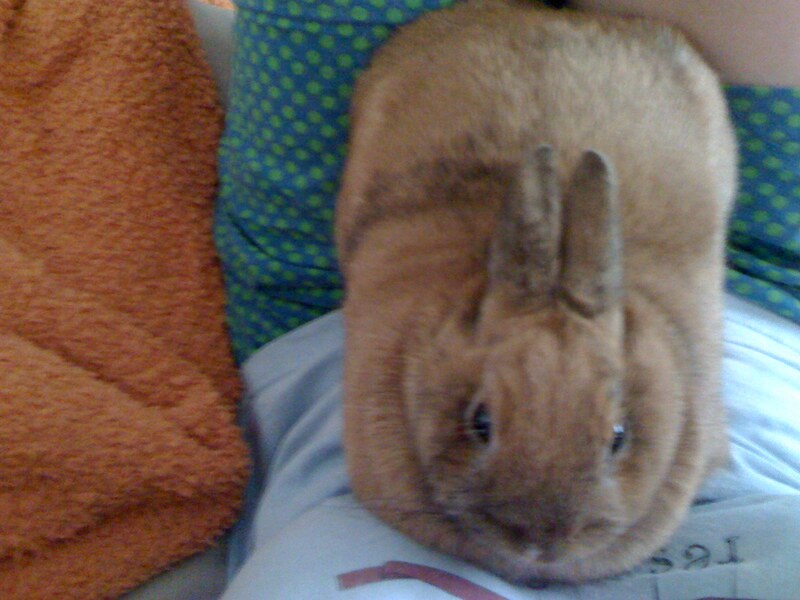 It may sound totally crazy and maybe I am, but this precious little rabbit has been a good friend the last 2.5 years! But, all of that to say, our precious little Megatron has become a part of the Phillips family. Honestly, I never really thought I would ever be so attached to any animal, especially a rabbit. But, he’s a pretty cool rabbit, hehe. The other day, Mega was obviously not feeling well. He wasn’t eating or drinking, along with other symptoms I’ll spare you, and I was up most of the night giving him water with a medicine dropper, getting him to eat as much as I could, and researching the internet like crazy to try and figure out the problem. We took him to the vet first thing the next day and found out he has a stone in his bladder and a bladder infection because of it. We’ve got him on antibiotics now for the infection and he must have surgery for the stone. The stone is the largest the vet has ever seen in a rabbit. Without the surgery, Mega will be in a lot of pain until he eventually passes away. The surgery is not exactly the cheapest thing in the world, but John and I both just couldn’t let a possibility to fix everything go right on by. Therefore, our sweet bunny is having surgery on Friday morning. We have been doing everything in our power to get Mega stronger. And, guess what? He’s doing better! The infection seems to be clearing which has been making him more himself. Today, he was strong enough to refuse to let me squirt the meds in his mouth, haha. Preparing me for this baby in my belly, I suppose?! The vet wants us to continue to give him the antibiotics through tonight and tomorrow so that baby bunny can be as strong as possible for surgery. Would you mind praying for our little bunny? I know it might sound silly, but I have been a crying trainwreck since he got sick. I really want my little buddy to be okay. Please pray that he makes it through the surgery nice and strong. And, that the vet can remove and repair everything that needs to be done to make Mega good as new. Also, pray that I will able to help the bunny recover well after his operation. We want everything to go as smoothly and healthily as possible! Best case scenario would be that this little bunny can be all healed up for when I bring this baby in my belly home! Just please pray the surgery goes well, I don’t think I could be more nervous about it. Y’all are awesome for reading everything about this bunny and for praying! Love y’all so much! ← 25th Birthday, Georgia Baby Shower and Baby Update! Praying, Jen! I know how precious animals are. They are family!